One fashion-forward way to celebrate Earth Month is by supporting footwear and apparel that's made with recycled materials. And we have an eco-friendly pick for you. In partnership with Parley for the Oceans, adidas Outdoor, the athletic brand in the outdoors, has designed a funky, unisex sneaker made from recycled ocean plastic. 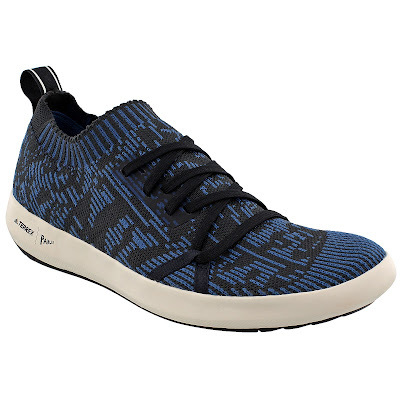 The Terrex Parley Climacool Boat Shoe for men and women ($140), features a knitted Parley upper, Climacool tooling for enhanced breathability and a Traxion outsole for stability and grip. And the Terrex Parley logo tee ($30) is knitted with Parley yarns from ocean plastic and has Climalite technology that is quick-drying and moisture wicking. The Terrex Boat DLX Parley ($130) will debut in August 2017, featuring a knitted Parley sock construction upper for ultimate comfort and a Traxion outsole for stability and grip. Adidas entered into a partnership with Parley for the Oceans in 2015, an environmental organization and collaboration network that raises awareness for the beauty and fragility of the oceans, and implements comprehensive strategies to end ocean plastic pollution. “The ocean is our most important eco-system on the planet, and it is important that we work hard to address damage being caused by its pollution,” said Greg Thomsen, managing director, adidas Outdoor U.S. In 2016, Parley intercepted a total of 740 tons of plastic waste in the Maldives, and adidas is now turning this plastic waste into apparel and footwear. In running alone, at least one million pairs of shoes will be created using ocean plastic by the end of 2017, which equals 11 million bottles retrieved from coastal areas.